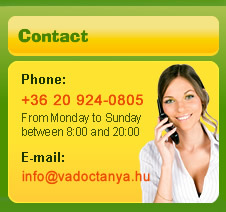 Welcome to the homepage of "Vadóctanya" Youth Hostel! Our establishment (something like "Rascal Paradise") is located in Gyenesdiás, on the northern shore of Lake Balaton, and can accommodate up to 80 guests. It is a perfect location for school trips, open-air schools, summer camps, summer camps for freshmen, training camps etc. Our youth hostel is gladly awaiting primary/grammar school classes, children groups, junior associations, sport clubs and families, companies of friends alike. - During our nearly 20 years more than 18.000 children have visited us. - Over 600 grammar schools, senior associations, foundations, public utility associations, sports clubs have brought groups to us. - We take pride in having a large number of returnig groups, which choose us again and again due to their positive experiences. Below you find the short description of our hostel - the reasons why you should choose us. But this is only a "sample", as on the following pages of our website you'll find detailed information on the establishment, on the different camps and other packages, and also on the programmes and places of interest in the surroundings. Our youth hostel offers comfortable accommodation at reasonable prices; our customers are perfectly cared for: we run a good cuisine, and await our guests in a friendly familiy atmosphere. Our hostel provides an excellent site for both indoor and outdoor programmes. With diversified professional and free-time programmes we make sure that children visiting us really enjoy themselves; they collect memorable experiences and useful knowledge, their personality develops and their creativity evolves. Over and above the opportunities provided by the lake and the beach the surroundings also offer a wide range of possibilities: natural, historical and cultural sights, like lookout towers, remnant hills of volcanic origin, caves, petrified lava columns, ancient castles and palaces, monuments, museums await our guests. Send us an inquiry and within 24 hours we contact you. As we are a youth hostel it is appropriate that we also tell you, why you should visit us with friends, classmates or even with your family. If you like what you read here, you have nothing else to do than recommend our site to your parents or to your teachers, so that you can make a decision togehter. You can not imagine what abundance of interesting places you can find in the surroundings: discover together mountains, rocks, forest paths, domestic and wild animals, deserted quarries, caves, castle ruins etc. As we are located at the shore of Lake Balaton bathing joy is of course included. Last but not least it is our pleasure to inform you that close to our hostel you can find the Adventure Park Spiderland, in which you can test your courage and dexterity on obstacles and elements, which most people only see in movies. But do not worry! - safety devices will keep you safe during this whole lot of fun. During development of our homepage we aimed to provide many useful pieces of information in an appealing, transparent and user-friendly visual environment, and help visitors gather information and make their decisions. An acknowledgement of our efforts was that during an annual competition called "Homepage of the Year (Az Év Honlapja)" which was already organized the 9th time, in 2010 the board of noted marketing professionals presented our site with the "Homepage of the Year 2010 - Quality Award" in category tourism. During the decision process factors like structure of the homepage, quality and quantity of information provided, good accessibility and easy manageability, the degree of interactivity, visual implementation of content were taken into consideration. Herewith we would like to express our thanks and promise that we keep on working humbly on our web presence and make sure that improvements will follow with focus on above factors.